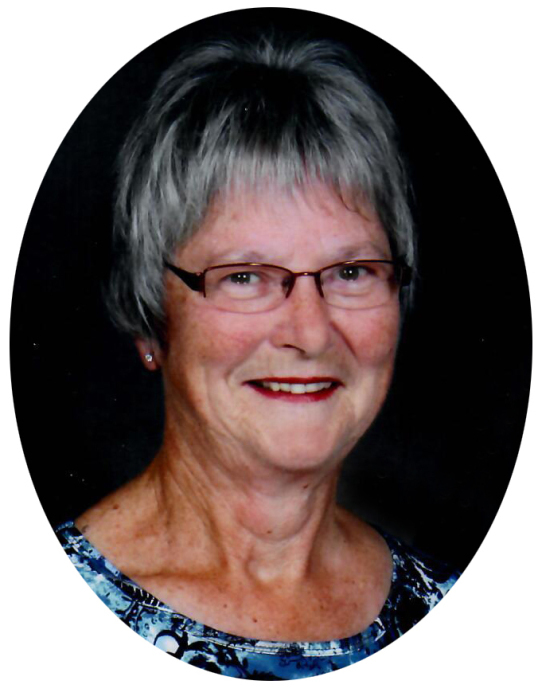 Elizabeth “Betty” Porter passed away peacefully with her family beside her at the Rosetown and District Health Facility on Jan. 22, 2019 at the age of 75 after a courageous battle with cancer. Betty was born on Oct. 18, 1943 in Dinsmore, SK to Rudy and Mary Puype. She received her schooling in Dinsmore and worked for a year following graduation before entering Nursing at St Paul’s Hospital in Saskatoon. She graduated in 1964 and obtained a nursing position in Rosetown. This is where she met her husband Bill Porter and they were married Oct. 23, 1965. They settled on the farm south of Rosetown where they raised Glenna and Doug. Betty worked briefly in the medical clinic and helped on the farm hauling grain and other chores. This was a very challenging time for a young mother with two small children juggling work, home and farm duties. Mom worked a lot of evenings at the hospital while dad looked after us. We moved into Rosetown in 1973 after Mom wouldn’t share the farm house with the badger that moved into the basement. From this time on we were "townies”. Mom continued to nurse and make a difference in her profession with her clinical expertise, caring hands, empathy and compassion. She was a leader in the Saskatchewan Union of Nurses helping negotiate contracts to give nurses fair wages and working conditions. She continued using her knowledge to make a difference on Rosetown Town Council, coordinating blood drives, as director for the Wheatland Regional Centre, bowling executive and numerous other committees. Mom’s financial skills landed her volunteer jobs as treasurer for the CWL, Dance Club, and her passion the Rosetown and District Health Centre Foundation. Mom worked tirelessly to ensure funds raised in Rosetown stayed in the community to benefit local citizens. Mom’s life-long dream was fulfilled when Rose Villa opened after all the hard work and fundraising the Foundation did over the years. Betty passed on the reins of treasurer but continued to be involved in the Health Foundation as chairman a position she recently gave up this past fall due to failing health. Betty and Bill traveled most of the world while they were able. They also enjoyed going south spending time with Glenna and Terry, getting to know neighbors who they enjoyed spending time and golfing with. Mom will be deeply missed by her family and many friends. Betty leaves to cherish her husband of 53 years Bill; daughter Glenna (Terry) Sparks and Cody Sparks; son Doug Porter; sisters Rose Prentice (Dave Turner) and her sons Norman (Gloria), Brian (Patty), Boyd (Deb), and Darren (Wanda) and their families; Madeline (Leroy) Alm and their children Brenda (Harvey) Schmidt, Wayne (Cathy) Alm, and Dennis Alm; and brother Richard Puype. Betty was predeceased by her parents Rudy and Mary Puype, and brother-in-law John Prentice. The Vigil of Prayer was held on Thursday, January 24, 2019 at 7:30 p.m. with Ms. Armella Rollheiser presiding. Mass of Christian Burial was celebrated on Friday, January 25, 2019 at 10:30 a.m. with Reverend Father John Abban Bonsu celebrating from St. Theresa’s Parish, Rosetown. The Rite of Committal followed at the Rosetown Cemetery. In lieu of flowers donations may be made in memory of Betty to the Rosetown and District Health Foundation, Box 653, Rosetown, SK. S0L 2V0.